Tell me about your avatar! From its insipid little chocolate chip smile to those hungry blueberry eyes, this pancake seems like a nice gal about town. But is she? Or is she just evil? I like the malevolence of this pancake that hides underneath the sunniness. 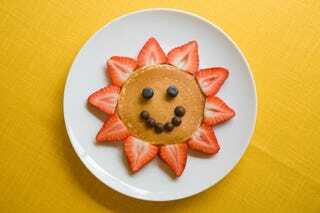 You know that this pancake is smiling because it's thinking about the worst possible things. SOOOOOON. What about you?